This is the first time seeing this movie. What better way to see this then on a lovely new Blu-ray. Twilight Time has chosen another forgotten about film and gave it, it’s just due. Like always a wonderful, beautiful transfer to this older film. This is the first time being on Blu-ray. This was a treat to see. A nice spy thriller with an amazing cast of legends. The direction, music, and storyline all worked in my viewpoint. Not ever seeing this before, I really had no expectations going into it, other than the great cast, and also the director behind it. I was surprisingly finding myself really enjoying this film. For some odd and weird reason I sometimes get it in my head the reason movies are never brought out on Blu-ray, or given any type of push, is because they are lack luster cinema, but every month I am proven wrong by Twilight Times releases. I don’t know why I think that about films, it’s just something I do, but in reality, I enjoy being put in my place after seeing these blu-ray's by Twilight Time. Scorpio is a worthy film to be praised, and also to be given this star treatment. Starring the one and only Burt Lancaster as your main character. Lancaster is a master of film. I just recently watched him in the classic Documentary series The Unknown War. He hosted this series of World War 2 Russian Front War Footage. He was a dynamic actor that gave so many amazing pieces of cinematic film for all generations. From the amazing 1960’s Elmer Gentry, which won him his Oscar, to 1962’s Amazing The Birdman of Alcatraz, which has also been a Twilight Time Blu-ray release, and you can read my review here: REVIEW . All one has to do is scan his amazing career, 1946’s The Killers, 1953’s From Here to Eternity, 1957’s Sweet Smell of Success, one of my personal favorites Judgement at Nuremberg which has also been a Twilight Time release, you can read my review here REVIEW. Lancaster had an amazing career of films lasting over 45 years of entertainment. This also stars the amazing Alain Fabian Maurice Marcel Delon. An amazing French actor that I feel never got his just due of stardom, or being a house hold name when talking about movies. He is another, like Lancaster that has been in so many wonderful films that are worthy of praise, and deserve to be seen, such as 1960’s Purple Noon, 1963’s The Leopard, and so many others. It was great seeing him in this film. Also starring the beautiful and stunning Joanne Linville. She was a huge TV star, starting back in 1950 until her retirement in 2005. Working on anything from Alfred Hitchcock Presents, to Have Gun Will Travel, One Step Beyond, The Twilight Zone, Star Trek, Gunsmoke, Hawaii Five-O, and so many others. She was fantastic in Scorpio. Scorpio stars a lot of amazing performers of that time period. The extraordinary Paul Scofield, Gayle Hunnicutt, J.D. Cannon and another personal favorite of mine, John Colicos as the character of McLeod. Colicos will always be remembered by me for playing in many TV series that I grew up watching in reruns. His most famous character to me is in the original Battlestar Galactica as the main character Baltar. He also stared in the original Star Trek as the important character of Kor in the episode Errand of Mercy, which I also remember him in. Movie wise I loved his character in one of the greatest underrated horror films, 1980’s The Changeling starring beside one of the greatest actors of all time, George C. Scott. But from my fondest, Teenage memory of him, was as the voice of Apocalypse in one of the greatest Animated TV series of all time, X-men 1992-1995. Interesting to note is he continued the character of Kor from the original 1960’s Star Trek in 1994 to 1998 in the series Star Trek Deep Space Nine. No matter if it was drama, sci-fi, action, both small, and large roles, he gave his all, and it’s utterly fantastic to see him in Scorpio. 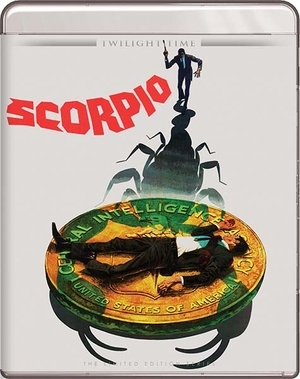 The plot to Scorpio plays out like all the great spy thriller's of the golden days of cinema. Your main character is Cross (Burt Lancaster). He works for the CIA. He is basically in the process of retiring. Now something else about the character of Cross is, he is a top notch Assassin for the CIA. Because he is retiring, he is training Jean Laurier (Alain Delon) a.k.a. Scorpio. Now to make things worse, the CIA puts out a hit on Cross. They accuse him of treason. They make Scorpio seek him out. The CIA goes about making Cross’s life a living hell. Through all this, many deaths, and choices happen. Cross and Scorpio, the CIA, and the Russians all come to the forefront of this thick plot, and back stabbing spy thriller that leaves the viewer on the edge of action, drama, suspense, and tension. A perfect watch of an old school crime/spy thriller. This is actually directed by one of my favorite directors. Which makes it all the odder I have never seen it. Michael Winner has done some of my favorite guilty pleasure films, starring one of my favorite tough guys, manly man actors, Charles Bronson. Winner was responsible for making the one and only 1974’s Death Wish. Death Wise is a golden ticket of revenge perfection. Winner also did the two sequels, Death Wish 2, and 3. I love this series and Winner is a priceless director in that regard. I loved his no holds bar style of film making with these three films. The Death Wish series is a perfect example of exploitation grindhouse style main stream movies. Solid director behind a series of violent films is always an eye opening experience. Winner and Bronson worked together many times. Winner always had away with capturing his characters in a brutal fashion. Bronson like Lancaster became somewhat a stable in Winner’s films. Now Winner’s career was a vast array of movie genera’s. From action, to thrillers, to comedy, to drama. He directed one of my favorite, underrated horror films of all time, 1977’s spooky, and disturbing The Sentinel. If you haven’t seen The Sentinel, I highly recommend. Scorpio is a wonderful watch. Awesome new outlet by Twilight Time to experience this 70’s spy thriller in a whole new way. This 1973 film has never looked any better, or sounded any better. I have never seen this, so I can’t compare it to anything, but what I can say is, I found no flaw in this reality of audio or video. I think it looked amazing, vibrant in color. The sound quality I feel is another great listen. I am not an expert, or claim to be an expert in dots, or technical mumbo jumbo. I look at film as a watcher, and lover of cinema, and enjoy it for the art form of cinema. When companies like Twilight Time honor films with high class products, I praise them, and honor them, because they show the respect that cinema deserves. The all-important isolated music track that most all these Twilight Time Blu-ray’s come with. The man behind this music needs no introduction, the one and only Jerry Fielding. He has done countless important pieces of cinema. The Peckinpah masterpiece, The Wild Bunch, and also Peckinpah’s great, Straw Dogs. Not only was he a Jazz master, but he was a brilliant, and flawless composer of music. Sadly, he was one of those blacklisted for many years during the crazy witch hunts of Communist idiocracy. Thankfully after many years of this foolishness, he returned, mastering many great pieces of cinema both great and small. He was nominated for 3 Academy Awards which he should have won all three. One for The Wild Bunch, which needs no explanation. He should have won for Straw Dogs, and the amazing The Outlaw Josey Wales. He did however receive an Emmy Award in 1980 for Outstanding Achievement. He deserved so many awards for his expertise, and flawless beauty in music. This special feature was a lovely listen to. Twilight Time honored this master with this special feature. You also get a wonderful Audio Commentary from three amazing Film Historians, the brilliant Lem Dobbs, the wonderful Julie Kirgo, and the awesome Nick Redman. All three are a brilliant 3-way of educated importance of cinema. Awesome listen. You also get the Original Theatrical Trailer. Another flawless and wonderful transfer by Twilight Time Blu-ray. A must experience film in this wonderful product. I loved seeing this for the first time. The movie is a classic style spy, espionage thriller, that lingers with you, and makes you watch to see how the conclusion unfolds. Dynamic actors, thick plot, wonderful direction, and a wonderful Blu-ray.